Half Moon Bay CA is situated 45 minutes south of San Francisco on Highway 1, but it might as well be half a world away. Home to the world-famous monster waves at Mavericks, Half Moon Bay is a sleepy beach town with a strong connection to the ocean—a perfect place for a walk along the beach or dinner at a local seafood spot. Some of the world’s best surfers routinely flock to Half Moon Bay for its huge, and sometimes dangerous, waves. Mavericks Surf Event draws in the risk takers, and the crowds, nearly each winter. 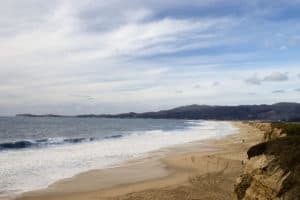 For places to hike, camp or horseback ride head to the five beaches of Half Moon Bay State Beach. For a list of all the great area beaches, click here. 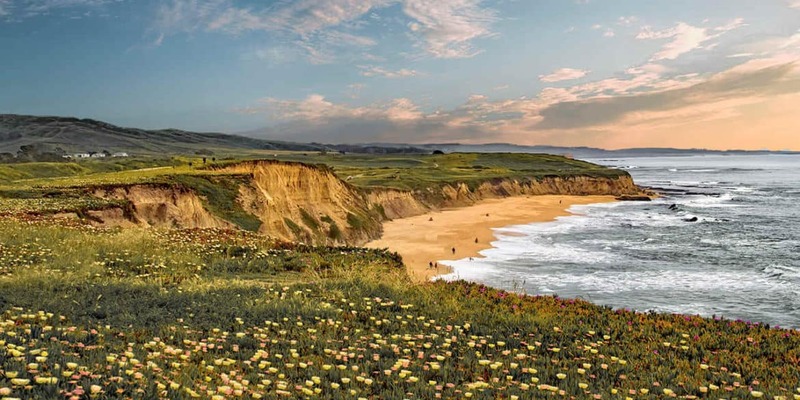 Half Moon Bay is as pretty as the name implies, with good reasons to visit all year-round. Tucked into a cove between redwood forests and Pacific Ocean waves, it’s a strikingly beautiful coastal corner of the San Francisco Bay area located 28 miles south of the city. Mild temperatures make it perfect for several of its hallmarks: an abundance of locally grown agricultural products, great golf, high caliber surfing and weekend getaways. Half Moon Bay CA weather makes it quite comfortable throughout the year with average temperatures between 40 and 75 degrees Fahrenheit. Half Moon Bay State Beach is one long sandy continuous beach below bluffs and dunes in the town of Half Moon Bay, California. Within the boundaries of this state park there are four separate named entrances and parking areas. North to south this includes Roosevelt Beach, Dunes Beach, Venice Beach, and Francis Beach. 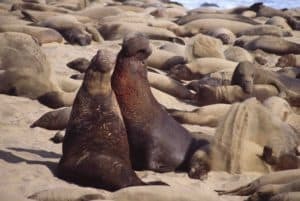 Located twenty-five miles south of Half Moon Bay, the park’s remote sandy shores play host to the mating, birthing, and molting seasons of the two-ton creatures that were nearly driven extinct in the 19th century. While the seals are clearly the stars, the park itself inspires with over 4,000 acres of diverse, mesmerizing landscapes—from a freshwater marsh to towering sand dunes—and a rich cultural history that includes historic structures from a bygone dairy farm. Explore dazzling coastal cliffs along the paved 1.3 mile trail and experience what car-bound motorists never could. In just two years, Devil’s Slide trail has become the most popular destination in the San Mateo County Parks system drawing visitors with its grand-scale splendor. 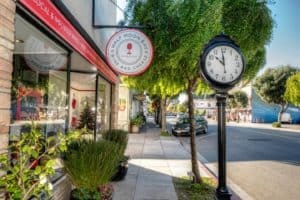 Today’s modern Main Street maintains its quaint and relaxed atmosphere, offering some of the best-in class dining and unique shopping experiences, while maintaining much of its original character. It’s where locals go to eat, shop and socialize. It’s where the world-famous Half Moon Bay Pumpkin Festival takes place. 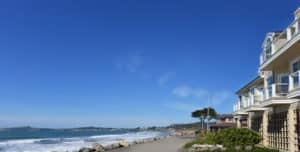 It’s where people come to embrace local culture, celebrating and revitalizing Half Moon Bay’s history through unique events, landmarks, and the heritage of this aptly named thoroughfare. The atmosphere is casual, the experience is rich. The Faraway Island is present throughout the inn. Guest rooms are as restful as the ocean breeze accented in tranquil colors of blues and grays – each with a private bath. All rooms have private baths, luxurious spa robes, DirecTV HD TV/DVD player, Free Wi-Fi. Some have king beds, fireplaces and whirlpool tubs. For more information, pricing, or to reserve your room visit the Nantucket Whale Inn. 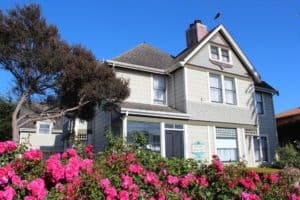 For guests who expect extraordinary personal service, warm hospitality and meticulous attention to detail, the Mill Rose Inn Half Moon Bay’s first B & B is what you’ve been looking for. 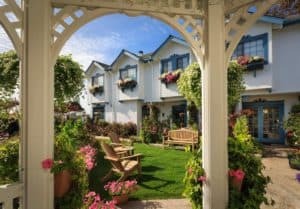 Experience the luxurious amenities, dine on the most sumptuous gourmet breakfasts, schedule a healing massage and enjoy the easy access to beaches, shops, galleries and restaurants of vibrant Half Moon Bay. For more information, pricing, or to reserve your room visit the Mill Rose Inn. This place looks amazing.. Half moon bay is another place i would like to go. I`ve been to San Francisco but never thought there`s a wonderful place like this just minutes away. Thanks for your article Leahrae! Yes, there is a wonderful place minutes away 🙂 Quite a few actually. The whole coast San Francisco coast is beautiful. Thanks for visiting beach travel destinations. You are so welcome Nia! Thank you for visiting my Half Moon Bay CA review and taking the time to leave me comments! Great article, I loved the reading! California is on my bucket list! One of the family members lives there, so it would be a great occasion to go to Hal Moon Bay Ca at the same time. Now that I have all the information I can easily plan my trip. I really thank you for this! 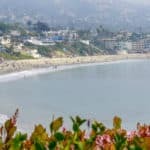 How long time is permitted to stay in Hal Moon Bay Ca for a non-US citizen? Glad you enjoyed Daniella! You can stay in the U.S. for up to 90 days, and that would be a really long vacation 🙂 Please let me know if you need any additional information. I enjoyed this article, especially about the place. It’s amazingly beautiful and if I have free time I wish to go there. You also cover most of the information that people need on this post. Glad you enjoyed Lan, and thank you for visiting beach travel destinations. I’ve never been so far north but I know if it’s anything like the rest of the golden state it very worth going. That waterfall looks awesome! I love finding hidden gems thanks for the post this will be a gem I won’t have to search for. Great doc, I am glad I have given you your hidden gem in California to visit. And it is one for sure! Glad you enjoyed my Half Moon Bay CA review. Another beautiful page! Thank you for taking the time to inform us about all the attractions and places to stay. You are very welcome Garrett. Thank you for visiting my Half Moon Bay CA review. Glad you enjoyed! The mild temperatures and the Devil’s Side Trail are huge attractions to me. I’m a big trail and nature guy so this would be a treat to visit and explore. Kayacking and Paddle Sports are up my alley as well. Anything that allows me to burn calories, even on vacation in other words. This definitely seems like a place to explore on the west coast. Then this is your kinda place Todd. I am the same way, and I love the area. So many activities, and such beauty to do them in. Can’t beat Half Moon Bay or the whole Northern California coast. Thanks for visiting! WOW, I didn’t know California had such beautiful places. The video taken by the drone really makes Half Moon Bay come alive. I was surprised at how big the waterfall was when I saw the guy kneeling at the top. I’ve been to California but to the big cities, so this is going to be one of the places I have to visit. I am going to bookmark this for quick reference of places to stay and things to do as it looks like all the information I need is here. Great Jeffrey, I am glad you enjoyed. Yes, the drone video just shows how amazing it is in Half Moon Bay. Thanks for stopping by! Wow, what a beautiful place. Thank you for showing with us attractions and how many activities can we do there. I wish to go there even if I’m so far from CA. You can always dream and have it on your bucket list 🙂 I don’t let distance interfere for me. You would love California, it is a beautiful place. Fantastic! Very informative and easy to understand. You hit on all of the major points researched when traveling to a particular destination. I would be curious of any local favorites/secrets and regulations/laws for the area. Otherwise….half moon bay, here I come! 🙂 Thank you for a great informative site. You are welcome Sherry 🙂 I am glad you enjoyed! Getting prepared to retire and travel the country in an RV. We will be going down the East Coast, across the country following the Gulf Coast out to the West. We were looking for places to see outside of the normal SF and LA. After reading about Half-Moon Bay, I believe will be on the West Coast a little longer than planned. Not that we are on a time crunch. Thank you for the locations to visit on the West Coast. You are welcome Ken, and have a great time. Please let me know if you need any additional information. Awesome! What a great information! Each and every thing you have noted here. It is highly informative article for those who wants to take enjoyment with beaches. Glad you enjoyed Amod! Thanks for visiting Beach Travel Destinations. What can I say! It looks like the perfect beach getaway! Plenty og wonderful sights and many exciting activities to do there. Looks stunning and you described it so well that I wanna pack and go now! Great Aspen! Get to packing 🙂 Please let me know if you have any additional questions. I have always wanted to visit California! This sounds like one of the places I would want to go. It’s so beautiful and has so many different activities to do. You have done such a fantastic job of covering all aspects of the area that people would want to research before booking. Definitely a great resource! Thank you Heidi! Glad you enjoyed Half Moon Bay CA. When my family went to California, we traveled along Highway 1, but must not have stopped at this absolutely gorgeous spot! What a shame! I can remember standing along the side of the highway, though, in amazement at how close you could get to the cliff edges! It actually made me a little uncomfortable! I really wish I had known that there was so much to do in this area, as it really should have been a stop on our trip down the coast. I guess that just means that I’ll have to get back out to California and make sure I hit this spot! Thanks for highlighting it! I am glad you enjoyed reading and learning about Half Moon Bay! Yes, time for another visit to Northern California for sure. Thanks for visiting! Hi Billy, yes! Half Moon Bay was actually an are where Bicentennial Man, Harold & Maude, Bandits, and House of Sand and Fog filed on location there. There were a few others as well. Very good eye! Thanks for visiting my Half Moon Bay review. Really enjoyed your post. 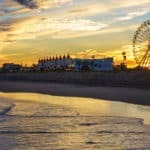 Being an Aussie it’s ingrained to love the beach and although CA is a long way from home this article has given me much food for thought. I am only really interested is holidaying near the ocean cause ‘Lifes a beach” isn’t it. Your post gives a great summary of things to do and places to go. Thanks for stopping by Paul and reading my Half Moon Bay CA post. Yes, I bet you do love the beaches! I live in Florida and I love the beaches 🙂 I am glad you enjoyed. 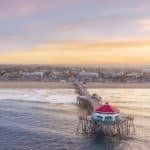 What a beautiful place and you do such a wonderful job of showing it through the drone video, attractions and hotel info here. I haven’t been to CA in many years but look forward to visiting this beautiful site. I didn’t see very many people along the beach, is the section shown in the video mostly private? I also noticed a large white building in the background. Is that a hotel? This area does not get as crowded as some other California beaches for sure. You know, I am not sure if that big white building is a hotel or not to be honest. I’d like to say yes, but I am not positive. Thanks for visiting Annette. My aunt and uncle live in California, and we’re planning at trip to see them, and one of the things he said we definitely need to do is hike Devil’s Slide trail. It’s one of his favorite spots, and he knows that my kids and I are big hikers, we love to explore new places and we love nature and the ocean. I’m super excited. I’m also excited to wander down Main Street and check out the various eateries. I’m not sure we’ll be there for the Pumpkin Festival, which is probably in the fall, but I’m sure they have lots of local activities. Great review! Oh you will have fun for sure. 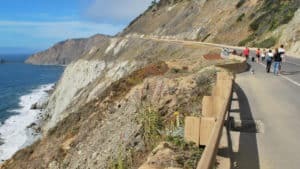 The pumpkin festival is something to see for sure, but I think visiting Devil’s Slide Trail is the highlight of the area besides the beaches for sure. Thanks for stopping by Babsie. I love the beach. Swimming gives me time to exercise and just to relax. Going to a picnic with family is the best bonding, as well. It’s one of the reasons why I love to go home to my home country. My hometown has lots of beautiful beaches. I hope one day, I can bring my family at Half Moon Bay. I hope you can too Marita! I agree that spending time at the beach, picnics, and just spending the time together is a great way to spend time with your family for sure. Thanks for reading my Half Moon Bay CA review. I love the hotels in the Half Moon Bay area. They look wonderful. You have made Half Moon Bay sound so wonderful, and I am ready to head to California! I have been interested in traveling to the United States, and California has always been at the top of the list. Thanks for all of the great information. You are welcome Kenechi. Thanks for stopping by. Half Moon Bay sounds like another great beach destination. I wish that I wish that I could visit some of the beautiful beaches that you write about in the US, but I am far too far away! Do you ever visit beaches which are outside the US? Maybe I will get to visit the US one day, and if so I will certainly seek out some of the beaches which you recommend. Hi Chrissie, You know there are beautiful beach locations all over the world. And yes, I have traveled to many different places to experience them ! I guess I’m what you might call a beach junkie LOL. I hope you can visit the U.S. some time soon and experience the beauty here. Great Charles! I am glad I could help you decide on an area of California to visit. Really you can’t go wrong visiting any of the coastline in California. It’s all beautiful. Thanks for stopping by!